Genetics schmetics! What is the difference between all the different methods used in conservation genetics? 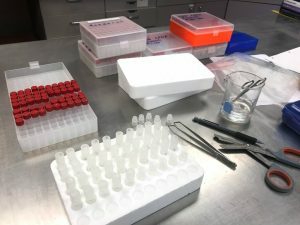 Genetics is a powerful tool in the field of conservation, but the topic of genetics is so large that it can sometimes be overwhelming to begin to even understand. So here is a quick cheat sheet on different methods and genetic markers that are used in the field of biology, ecology and conservation in general. Using genetics can help us understand the evolution of an organism, assess the status of a population, and conserve a species. The basis for all of the is DNA, which can be found in every single cell of all life on earth! DNA helps us in species identification (very useful when two different species have very similar physical characteristics), understanding taxonomic relationship ( this can be important when making natural resource management decisions and guiding conservation/restoration efforts), determination of hybrids, identifying individuals with in a population, determination of parentage, migration of populations, genetic variation and historical size of populations, and also has forensic applications (like tracking down poachers!). 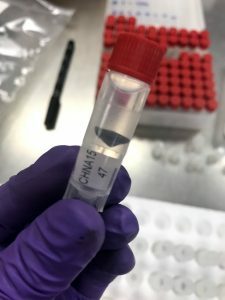 As you can see there are many applications for genetics in conservation, and since DNA can be found anywhere, even in poop, it makes it a great tool for scientists and managers in this field to use. Ok, let’s say I have convinced you that genetics is awesome, but now what? 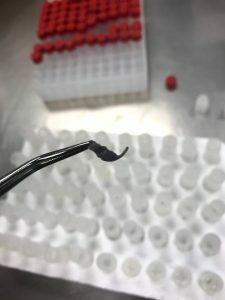 There are so many different methods out there, how do I know which one I should use? 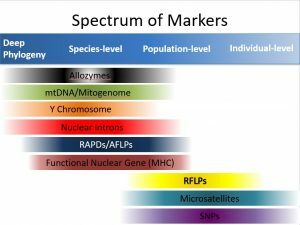 In genetics different methods are known as markers. Which marker you need depends on what you want to learn. Here is a quick reference to what markers to use depending on the questions being asked. Allozymes: nor really used that much today, but used to be used for population differentiation. As you can see, there is some overlap in the markers. 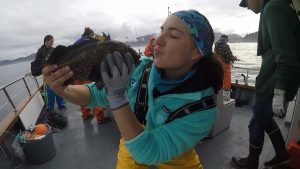 In my case I a m studying China rockfish, and looking at how ocean currents affect their dispersal. 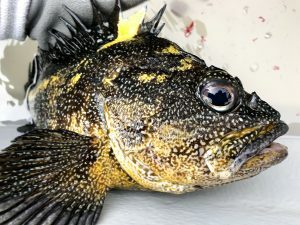 To do this I am looking at whether the China rockfish in Oregon are connected, via ocean currents to China rockfish in Washington. I had the option of using microsatellites or SNPs for this. Even though both can provide information on gene flow, parentage and relatedness, I chose to work with SNPs because I am interested in a greater level of detail that microsatellites does not produce. Hi Alex, thanks for this post! It was a nice, easy run down of the different types of genetic information used in conservation and management. Im definitely convinced on its power as a tool in this field! It was nice to see a couple of other examples too. Thanks!